I first encountered Cranks Restaurants when I was about 10 and on holiday in Devon with my parents. I was going through quite a phase for all things ‘crafty’ – dying wool, weaving, pottery, woodwork. I’ve never quite emerged from it. I was not alone in my obsession. At the time ‘natural living’, alternative medicine and self-sufficiency were quite the thing (thanks, in part, to ‘The Good Life’). If you were at all arty or bohemian then the place to visit was The Dartington Cider Press Centre in Devon, housing as it did workshops, a gallery, a nature trail and, crucially, a Cranks Restaurant. Now my parents were not in the least arty or bohemian but they did appreciate a good cheese scone and a cup of tea and they were endlessly indulgent of their somewhat odd daughter. The visit is still vivid in my mind. There was an exhibition of hand dyed and woven textiles in the gallery and we ate carrot cake for the first time. Many years later as a student in London a trip to a local Cranks restaurant was my start of term treat (and end of term too if there was money left). Cranks in London seems, alas, to be no more but there is still a restaurant at Dartington. The fare then was hearty, wholesome, traditional vegetarian and I think both the food and the ethos fell out of favour somewhat in the 1980’s. Thankfully, the books remain (supplemented by newer aditions which reflect a more ‘contempoary’ approach to vegetarian cookery). 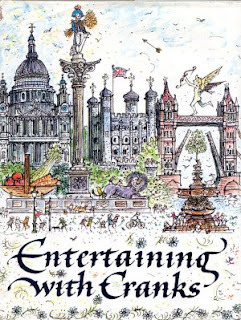 My copy of Entertaining with Cranks is a relatively new purchase from a favourite charity shop. The cover is delightful, with more lovely pencil drawings by John Lawrence throughout. The distinctive calligraphy on the cover is by Donald Jackson whose work was used throughout the chain for menus and signs. Despite the title, there is nothing really fancy or intimidating here. This is not food you need to dress up for. It is relaxed, retro food that you would want to eat in the kitchen with good friends. Chapters include Appetizers and Starters, Soups, Salads and Dressings, Main Courses, Puddings and Desserts, Bread, Rolls and Toasts, Cakes and Biscuits and Drinks. Among the recipes are Mushroom Herb Pate, Curried Pea and Apple Soup, Green Lentil Rissoles with a Yoghurt Sauce and Poached Plums with a Cinnamon Cream.